Whether it's a cryptid like the the Orang Pendek, the mythical Mothman or searching for haunts in the Midwest, no paranormal case is out of the ordinary for Allison Jornlin. 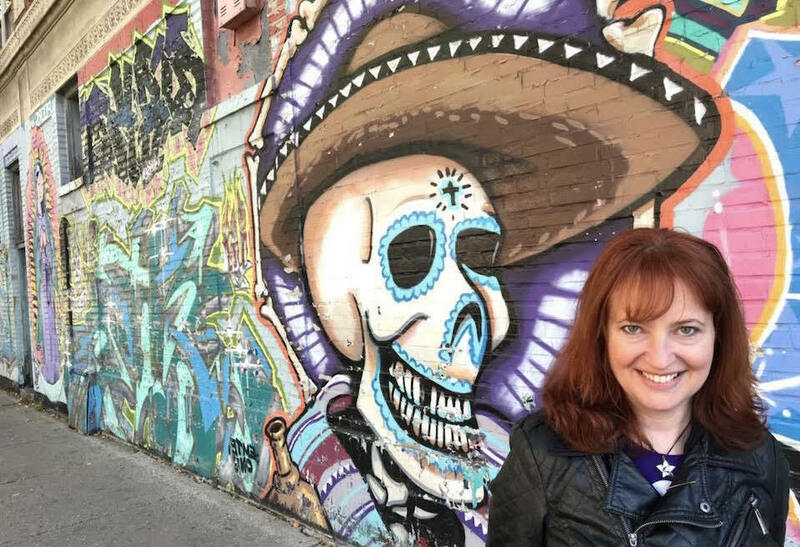 Jornlin, an award-winning 20-year veteran of paranormal research, will be curating this year's Hawaii ParaCon, and also recently got back from a Chicago Mothman expedition. Jornlin is also a fellow plant-powered paranormal investigator along with this author and Jason McClellan. Below, Jornlin talks about the backlash for her Mothman findings, what 2018 holds, and her interest in the field. Q: What first sparked your interest into the paranormal / unexplained? JORNLIN:" I've been moved to wonder by the essential questions since childhood. Frankly, I don't see how you could be human and not wonder about such things. Who are we? Are we alone in the universe? What happens after we die? What's for lunch? Such heady inquiries, and an unquenchable thirst for adventure has motivated me throughout my life to pursue the study of the paranormal in whatever way I can and to evolve into one giant weirdo." Q:You recently visited 60 sites in Chicago area where Mothman was sighted. What was that experience like, and what’s mindset going into a search like that where you know it will be hard to find answers ? JORNLIN: "Searching for the Chicago Mothman was just another opportunity to trail the unexplained. I knew I'd find something, even if it wasn't what I expected. Truth is, I'm looking for any excuse to escape the mundane and hunt monsters! Unfortunately the actual experience of was less "X-Files," and more "A Few Good Men" -- "You Can't Handle the Truth!" I originally set out to document the sightings by visiting each location, recounting the associated tale from Lon Strickler's "Phantoms & Monsters" blog, and following in the footsteps of witnesses to see what I could learn. I then broadcast from each site on Facebook LIVE and uploaded the video to my YouTube channel (http://www.youtube.com/Mothman). Early on everything was copacetic. Lon linked to my videos from his popular Google sightings map. My brother and I even featured him on an episode of our weekly podcast (http://othersidepodcast.com). However, when I began to notice inconsistencies, discrepancies between the reports and actual facts (architecture, landmarks, weather data, etc. ), and realized that the accounts read more like a creature feature than typical eyewitness testimony, I got into some trouble. I asked a few too many questions, so Lon kicked me out of his Chicago Phantom Task Force, and he and his cronies have publicly and privately disparaged me ever since. One Lon-cronie actually commented to other task force members that our differing views made him want to "slap" me. So I must be doing something right, eh? The adventure taught me most about what needs to change in paranormal research. I was disappointed by the lack of rigor I saw in the field. For some "investigation" seems to mean taking any old thing a self-identified witness tells you as gospel and slapping it up on the Web without any critical thinking. Unfortunately such dubious accounts make excellent fodder for the proverbial book deal. However, we all deserve better. There are real mysteries out there that rise above the muck of fabrication and misidentification. In 2018, I hope truth-seekers will band together like never before to discover what's strange, but also true." Q: What do you think Mothman is really ? JORNLIN:" Oh, I really can't claim to know. The Mothman flap of 1966-1967 in Point Pleasant, West Virginia encompassed a wider, very different set of phenomena than the recent sightings in Chicago, which pale in comparison. In Chicagoland, there was no associated high strangeness as in the original case. No UFOs. No MIBs. Perhaps, today's hoaxers lack the imagination of their predecessors and are forced to rely on obvious copy-cat hokum, or something far weirder was going on in Point Pleasant that can be wrapped up neatly in a simple narrative. In any case, it seems a little too convenient that the Chicago sightings all happened in just enough time for Lon to publish a book by Dec. 15, 2017, the 50th anniversary of the Silver Bridge Collapse, a tragedy long associated with John Keel's classic depiction of the Mothman. That being said, I do know credible people see strange things in the skies. In 2000, I uncovered two witnesses to a pterosaur-type creature spotted flying over Wisconsin. One was featured in Loren Coleman's book. I've also seen things I can't explain with my own eyes. I know enough to say that UFOs are real. They are more than misidentifications, although I can't say exactly what they are." Q: Out of all the cryptids, which one do you think is most likely to either to discovered and/or real? JORNLIN: "Little Foot! Orang Pendek is my favorite cryptid because I think it is most likely to be real and discover-able. This diminutive creature,which is just 3 feet tall, (has) been spotted by native people and environmental activists including a tiger advocate and a wildlife photographer. The wee beast hides in the Indonesian archipelago, which is an incredibly fertile and remote group of over 13,000 mapped islands. The discovery of the skeletal remains of a tiny, new species of human called Homo floresiensis in 2003 on the Indonesian island of Flores is another intriguing development. A possible link to the fossil record, the ideal wild habitat, and a wealth of credible native and non-native witnesses makes Orang Pendek the most plausible flesh-and-blood cryptid in my opinion. Q: What do you think will be the biggest stories in 2018 regarding the unknown ? JORNLIN: "I know this might not be popular to say in some circles, but I'm hoping the coverage of recent UFO news in the New York Times continues. I know it's not exactly disclosure, but I think it could lead to a gentrification of the subject matter that evicts the study of UFOs from the fringe ghetto by moving it on up and making it more accessible to the mainstream. This may be our opportunity to ensure that the study of UFOs continues. It's a chance to reach out to a younger generation and get them involved in the topic." Q:Why is it important the unexplained, paranormal and supernatural are studied? JORNLIN: "Don't we want to know the answers to those essential questions that seem to be so connected with our very existence? The pursuit of the unexplained will uncover resources for all life that we can't even imagine right now. Now more than ever, as political forces which seem bent on destruction pull us apart; we need to come together internationally in the spirit of open inquiry and child-like wonder. That's why I'm helping to organize an international conference that will bring disparate cultures into contact and collaboration for the first time in the paranormal field. " JORNLIN:" I dump Daiya Mozzarella shreds on everything, and I'm gobbling down a Beyond Burger right now! Did you know Beyond Meat is coming out with three different flavors of sausages? And want something paranormal?! Have you ever tried Follow Your Heart's Vegan Egg? How does that even work? Some kind of strange, molecular gastronomy wizardry going on there! This must be the best time in recorded history to go fully veg, it's the Golden Age of Veganism!"